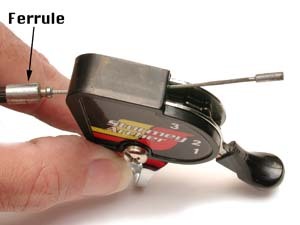 This article applies to the classic Sturmey-Arhcer trigger control, which is still produced (2010) and used on new three-speeds. Most often, a cable needs to be installed because the old one has broken. It usually breaks inside the trigger control. If there is still a piece of cable in the slot of the trigger, slide it out. Pull the old cable out of the housing at the hub end. Check the housing, and adjust or replace it if necessary. Install the new cable in the housing. Advice on installing and lubricating cables is in another article. 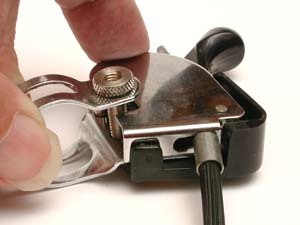 To install the cable in the trigger, first, pull the trigger down past the "1" grear position. This will cause the pawl to lift up higher than usual so you will be able to slide the cable in from the slotted hole in the trigger housing. 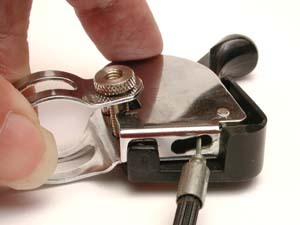 If the trigger unit is mounted on a straight section of the handlebar, you may not be able to pull the trigger down as far as shown, because the trigger handle will bump into the handlebar. Normally these triggers are intended to be mounted on the outer side of a curved section of handlebar. 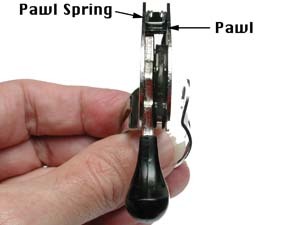 Note, the decorative plastic trim has been removed to show the pawl and spring more clearly, but you do not need to remove the plastic to install a cable. Older model triggers do not have the plastic cover. Lead the bare cable down along the slot in the trigger cam, with the cable end going past the end of the slot. Shift the trigger into "3". You may have to push the lever up, because the cable is not pulling on it as it would in use. Pull the cable snug to seat the cable end into its notch. The illustration above shows how it fits, but the trigger is not in top gear for the photo, or it would be harder to see. 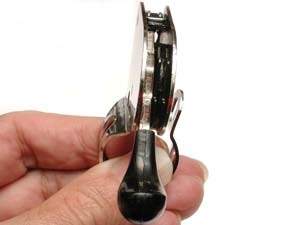 Once the inner cable is seated into the back of the cam, push the ferrule into the wide opening of the keyhole-shaped slot, then up to its normal position. 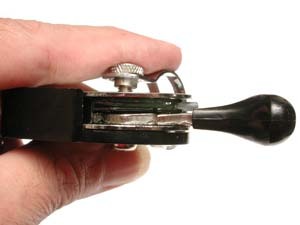 Note: Very old triggers use a ferrule with threads, instead of having the keyhole-shaped notch shown. If you have this type, you will need to re-use the original threaded ferrule in place of the modern ferrule shown. Leave the trigger in third-gear position. Grease the threads of the anchorage's anchor bolt. Insert the cable through the hole in the anchor bolt, between the washer and the head of the bolt. Thread the anchorage most of the way onto the indicator spindle. (as the chain wears and the wheel has to be adjusted rearward, the anchorage will need to be backed off). Slide the cable through so it is just barely slack. Tighten the anchor bolt.